One of the questions people asked after DCUC17 Wonder Woman was revealed was whether or not she'd have a new body, and Mattel assured us she would - and she does, if you take "body" to mean "torso," because the arms and legs are reused. The costume details are merely painted on the limbs, so those are all reused pieces (and the paint has the same problems we mentioned on DC Direct's attempt, so apparently it's drawn that way on a model sheet somewhere). Her torso is definitely new, though, with all the edges of the costume raised, including the golden bands on her hips and cleavage. The paint on mine has some problems - though since I ordered online and these aren't in any stores yet, there's no saying whether that's true for all of them. There's a big blop of gold paint off the side of her crotch-star, and the lines on the legs aren't very crisp. Her collar and the star on her forehead are a dark purple not used anywhere else on the figure, and thus look completely out of place. Wonder Woman is as articulated as most other DCUC figures: however, she's traded the "torso hinge/waist swivel" combo for a single swivel joint under the ribcage. It's not a good replacement, by any means. Not only can she now not bend forward or back, the dang thing barely even turns, so the torso might as well have been cast in a single solid piece. The joints in the legs are soft and gummy, making them hard to use, and the high collar keeps her head from moving very far. She includes a Star Sapphire lantern battrey, though as a 24-hour deputy, she never actually used one. At least you can give it to Star Sapphire, who needed one but didn't have it. 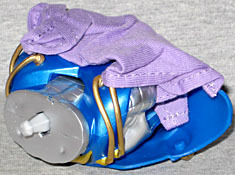 The figure includes the torso of the Series 17 BAF, the Anti-Monitor. It's a big, detailed piece with soft pvc armor on the shoulders and the softgoods cape bundled up behind it in the tray. Star Sapphire Wonder Woman is a rather disappointing figure. She's poorly made, with bad joints and a sculpt that isn't as good as DC Direct's. As Artemis said, she's appallingly skinny, lacking the overt femininity of Karen Palinko's sculpt. As much as it pains us to say this, especially about a Four Horsemen product, she's not worth buying. Unless all you care about is the articulation buy the DC Direct figure, and get the BAF part secondhand. This entry was posted in blog exclusive review, DC, Four Horsemen, Mattel and tagged DCUC, Green Lantern, Wonder Woman. Bookmark the permalink.